To reap the benefits of ginger oil, you can use either fresh or dried ginger root. The most popular methods of making ginger oil are maceration and heating. Oftentimes, the first method can be followed by the latter. In the blender or food processor, add the ginger and cover it completely with your oil of choice. Blend the mixture until you obtain a substance with a grainy, pesto-like texture. 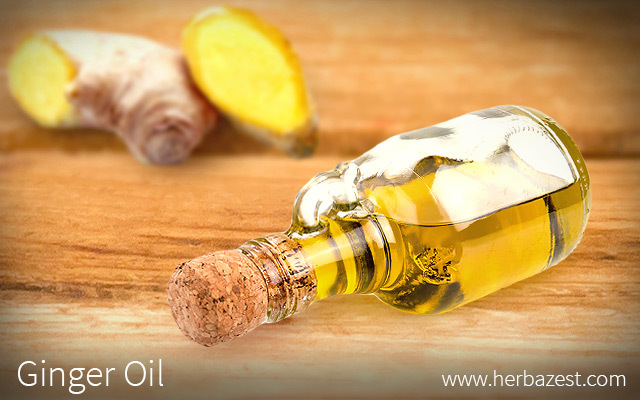 This allows for better absorption of the active compounds of ginger in the carrier oil. Transfer the blended mixture to a clean, dry glass jar. The mixture must be covered by one or two inches (2.5 - 5 cm) of oil. You may add more oil if needed. Seal the top of the jar and place it in a fresh, dry, dark cabinet. After a minimum of four weeks, take out the jar and strain the oil using a muslin cloth or a very tight weave of cheesecloth. Using clean, dry hands, be sure to wring out the cloth well in order to get every drop of the oil containing ginger's medicinal properties. Keep the ginger oil in a clean, dry jar and it will be ready to use. Place the mixture of oil and herbal material in a bowl and nest it in a saucepan half filled with water that is already over minimum heat. The bowl should fit tightly in the saucepan, but it shouldn't touch the water. This is called a double boiler. Let the mixture simmer at minimum heat for four to eight hours. Use a kitchen thermometer to be sure the oil is always under 110F (43C). Also be sure that the water doesn't evaporate completely. Do not leave the preparation unattended. After the appropriate amount to time, remove the infused ginger oil from the heat and let it cool. While it is still warm, strain the mixture as described in step four above and store the oil in a clean, dry jar. Both of the above described methods can be applied when combining ginger root with other herbs that exhibit similar properties, such as ginseng and chamomile. Ginger oil made in this way can last for two to three years when kept refrigerated. The medicinal properties of ginger oil are typically used for treating gastrointestinal issues, headache, migraine, and nausea. While it is not common to use ginger oil topically - since unless is diluted, it can cause skin irritation - ingesting it can be an excellent and effective way to reap the benefits of ginger oil. Extensive scientific research has corroborated many of ginger oil's benefits. A study published in the Journal of Basic and Clinical Physiology and Pharmacology (2015) suggests that the use of ginger oil may help reduce oxidative stress and gastric ulcers. Likewise, the results of a laboratory test published in the Indian Journal of Physiology and Pharmacology (2013) revealed that ginger oil exhibits antioxidant activity, as well as significant anti-inflammatory and analgesic properties. Finally, a study published in the Journal of Agricultural and Food Chemistry (2016) found ginger oil to be effective in enhancing the antioxidant capabilities of mouse liver, thus indicating that it may be a good dietary supplement against metabolic diseases. Ginger oil is very easy to make at home as long as you have the time and patience. Its many health benefits and medicinal uses make it an excellent addition to any herbal cabinet.